With spring in the air, fresh seafood and champagne triumphantly return to New York City’s most beloved shoreline restaurants. From afternoon lobster rolls to ornate oyster platters, pair your shellfish delights with sparkling sips at these six downtown venues. Since 1997, this iconic SoHo brasserie, basked in cinematic lighting and lined with mahogany booths, has served as a de facto seafood institution. 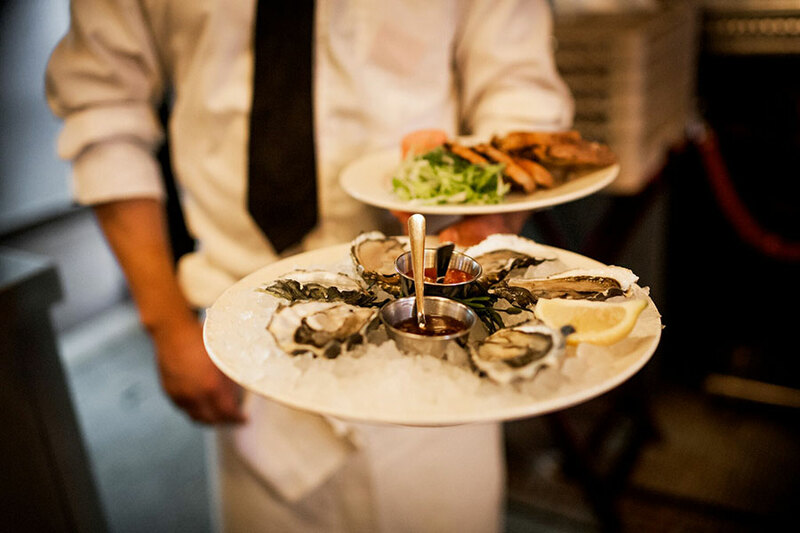 Thanks to its just-shucked raw bar, patrons nosh on the three-tier Le Balthazar, loaded with impeccably sourced East and West Coast oysters, clams, shrimp and chilled lobster. To drink, clink glasses of Taittinger or opt for niche rosé bottles of Philippe Gonet. In a mood to celebrate? Order a go-big-or-go-home bottle of Krug Grand Cuvée. For bright, fish shack vibes, pop by this MacDougal Street storefront. Commence with a dozen oysters; the venue chucks 16 varieties (think East Coast Wellfleets, West Coast Totten Inlets) best washed down with half bottles of ‘Autreau de Champillon champagne. Still hungry? The signature lobster roll with crispy Old Bay fries is a crowd-pleaser. And come Sundays, the hearty Lobsterpalooza is served with red bliss potatoes and corn on the cob. From the folks that brought you the red-sauce shrine Carbone, a few doors down, ZZ’s Clam House, a tiny, dimly lit venue, is devoted to all things oceanic. Nab a stool at the 12-seat marble bar featuring a sprawl of East Coast oysters, caviar, and assorted crudos. In between sips of Gatinois champagne, marvel at the arrival of fresh ceviche starring lobster, avocado, razor clams, Meyer lemon, and radish. Be sure to procure a reservation. Drop by this venerable Sullivan Street restaurant (est. 1992) for raw oysters from Connecticut to British Columbia, or opt for the famed two-tier platter of fresh crab, oysters, scallops, and Maine lobster. The classic bistro decor is peppered with warm globe lamps, slanted mirrors, brick walls, and white tablecloths, and is known for its nocturnal crowd who celebrate with chilled bottles of Billecart-Salmon Brut Reserve until the wee hours (the venue stays open until 4am). If you like your oysters served with a spritz of salt air and a musical twist then Roxy’s Oyster Bar is the place for you. The Art-Deco-inspired bar with warm lighting and playful touches like the vintage seashell sconces and glossy fish-scale walls, promises a sensory tour of Cape Cod and beyond without having to leave the comfort of your seat. It’s all about the freshest local seafood sourced from the East Coast waters. We’re talking lobster, prawns, mussels, seafood chowder, Alaskan crab, and littleneck clams. For those looking to really indulge, settle in for the evening with a bottle of Billecart-Salmon Brut Reserve and the famed three-tier seafood plateau—all set to the sounds of Roxy’s resident pianist.